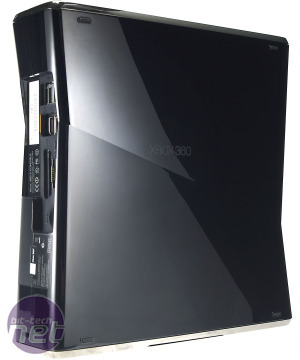 The first thing to say about the Xbox 360 Slim is that the title is a bit of a misnomer. 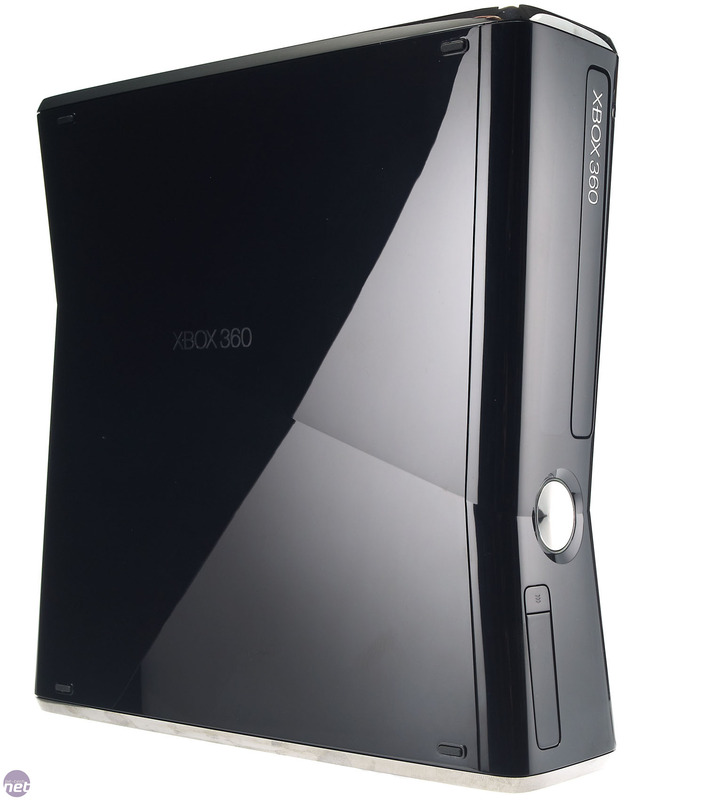 Really, it should be called the Xbox 360 Short, because the first thing anyone notices about it is that it isn’t actually much slimmer than any previous models – though it is shorter when stood on it’s end. And if we're being really pedantic, given that the official designation for the machine we're calling Slim is ‘Xbox 360 S’, renaming is as the ‘Short’ makes just as much sense. 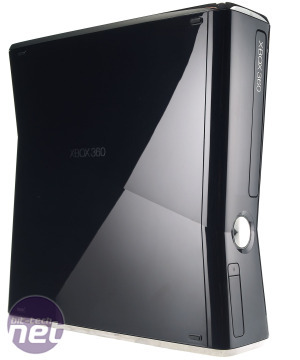 Even then, while the new Xbox 360 is noticeably shorter than the off-white original, there still isn’t all that much in it – not enough to indicate a dramatic redesign, anyway. Stood on its end, the Slim model measures 270 x 260 x 78mm (H x D x W) by our measurements. By comparison, ye olde Xbox 360 Premium measured 305 x 260 x 82mm. So, it’s roughly half a centimetre slimmer and three and a half centimetres shorter, by our reckoning. That’s not a trimming to be sniffed at, but it does bear pointing out that the Slim isn’t to the Premium as the Macbook Air was to a G4. Most of the space has been saved by a single design too, namely shifting the Xbox 360 hard drive so that it no longer sits bulkily on top of the console in that ludicrously over-sized grey enclosure. The new Xbox 360 Slim hard drives are much more modest in physical size, measuring just 105 x 20 x 75mm to the older model’s 195 x 24 x 79mm. The new drives also swap the old bespoke connection for a standard SATA port too, though we don’t imagine that’ll make it any more possible to use a standard laptop drive in an Xbox 360 Slim. Custom file formats and the like will still form a barrier. 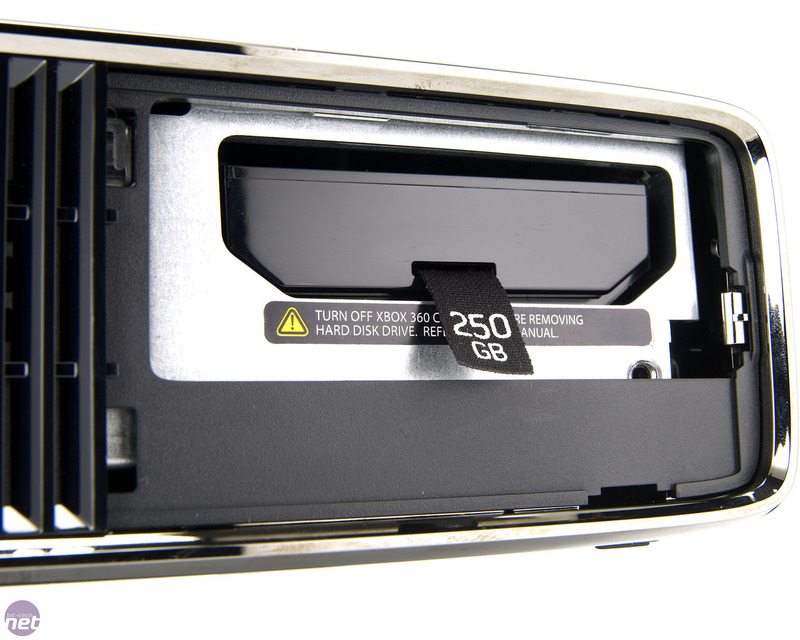 The hard drive for the Xbox 360 Slim no longer slots on top of the console either, but slots inside the main body instead. A hidden button on the bottom end of the Xbox 360 Slim causes a section to drop away, revealing a space for the HDD to be slotted in. The new Xbox comes with a 250GB hard disk - the same capacity as the Xbox 360 Elite bundle had - as standard. Speaking of which, when you buy the Xbox 360 Slim you also get a single black, wireless controller, a wired headset and a composite video cable. While there's no HDMI cable in the box, the Slim does have HDMI output. Microsoft have finally addressed the 360's lack of WiFi, integrating 802.11 b/g/n wireless networking. On the other hand, the Xbox 360 Slim has lost some connections too, though not any functions. The old memory card ports have been swapped for two extra USB 2.0 ports, which makes sense given that a recent Xbox 360 firmware update added USB storage to the console. 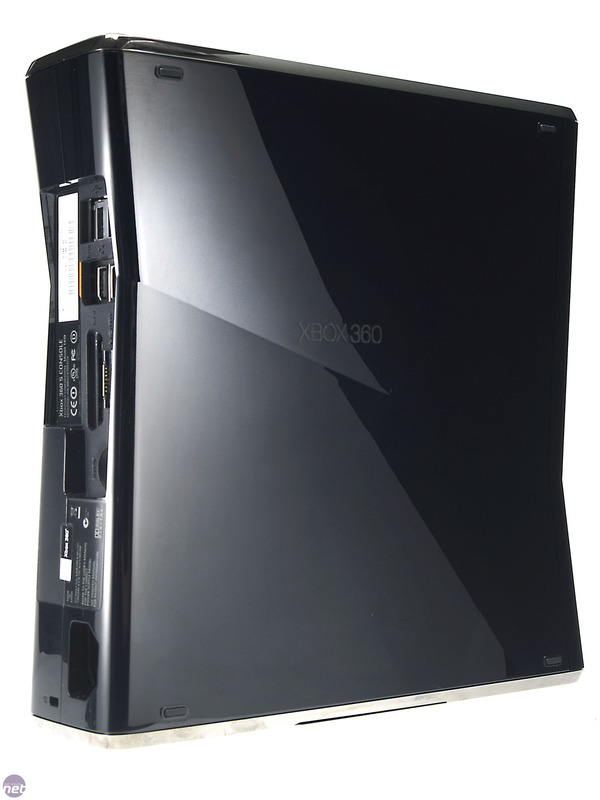 There are now five USB 2.0 ports on the Xbox 360 Slim in total (two more than previous versions); three on the back, two on the front under a hinged panel. Interestingly, the Xbox 360 Slim also has a new port especially for Kinect, Microsoft’s upcoming camera-based motion sensor controller. This port will provide power to the Kinect sensor when it launches, meaning that Xbox 360 Slim owners won’t have to use a separate power source for Kinect. Owners of older Xbox 360 models will still be able to use Kinect, but will have to use a separate power lead which is expected to be bundled with Kinect when it finally hits shelves.